“Milk is very exfoliating, and honey will instantly have skin feeling soft and supple. It sure worked for Cleopatra (milk baths were a main part of her beauty regimen)— she was known for her radiant skin,” says Martinez-Randolph. The recipe: Mix 1-2 cups of whole milk and ½ cup of honey in warm running water; soak for 20 minutes. “This is great for itchy skin, dry skin, sunburned skin, and wind-burned skin,” she says. The recipe: Stuff a clean, tall sock with about ½ cup of traditional oatmeal (not instant or Irish-style). Tie a knot at the top of the sock. Fill your bath with warm, not hot, water, constantly keeping the sock submerged. Squeeze the sock as it gets wet. Within a minute or so, the sock will begin to feel slick and soapy and your water will get milky and cloudy. Remove once your bath is full. The recipe: Simply pour a glass or more of red wine or champagne into your running bath; soak for 20 minutes. “The magnesium in Epsom salt can ease muscle pain, and lavender helps reduce inflammation,” she says. 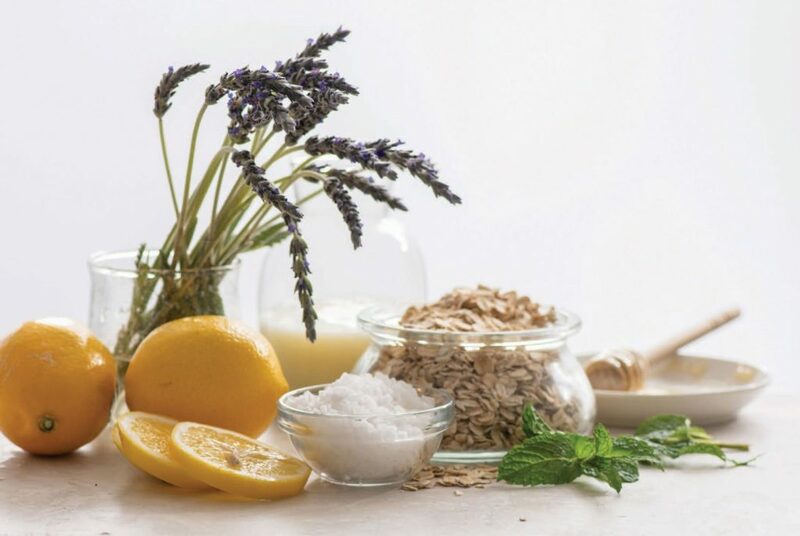 The recipe: Mix 1 cup of Epsom salts and ½ cup of dried lavender into a full bath. “The aroma from peppermint essential oil leads to increased alertness, while the scent of lemon is said to enhance positive chemical reactions in the brain,” Martinez-Randolph says. The recipe: Juice five lemons into your bath water, add 5-10 drops of peppermint oil, inhale, and relax. Apply coconut oil, a great natural moisturizer.